. Closed Tags: ballyculter, downe hospital, dunleath park, Public Sector Campus, right-of-way. 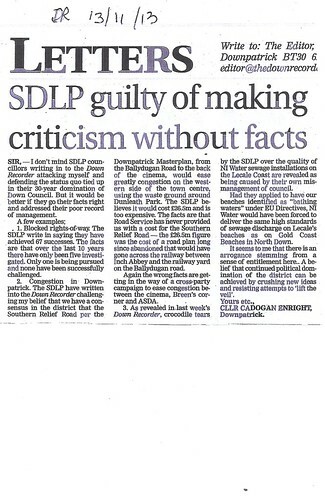 BUT ALSO making it clear that the SDLP are wrong to oppose connecting the Ardglass Road, the Hospital and Public Sector Jobs Campus to the Ballyduggan Road using the waste ground at the back of Dunleath park and the Cinema. The future of this vital economic hub could be secure as no-one could say that they were not connected to vital roads infrastructure. The SDLP are totally at sea on local infrastructure despite being in power for 30 years.